The small guitar have gotten a bit further, despite me being away all the time on work trips. This month I've been to India twice and I'm leaving for Palestine tomorrow. But the neck is carved and fitted, the top is bound with tortoloid binding, and as you can see in the pic I've tuned the bracing some. It might just be ready when I said it would be. I bought this splendid tool from Dominic Pieranunzio, aka Dominator. 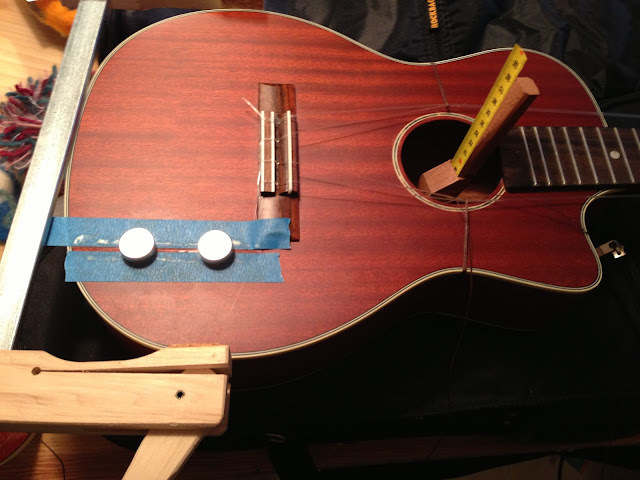 He's a very talented musician, ukulele builder, and tool maker. I saw one of these made by Chris Paulick (forgive me if I mis-spelled) and I've wanted one since. But I never got around to trying to build one. So when Dom said he had one for sale I bought it immediately. 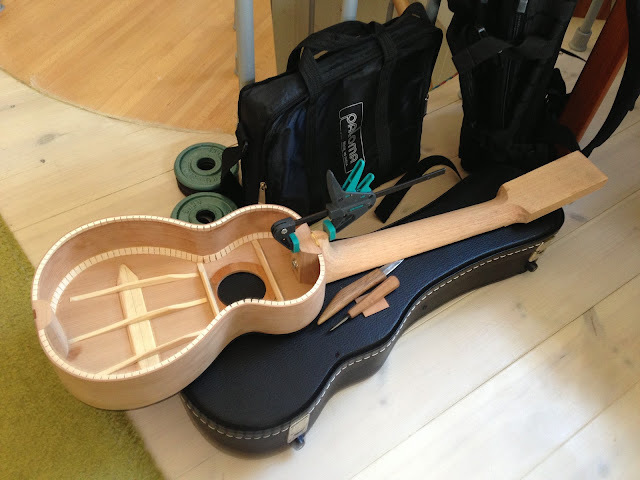 I've had it for a couple of months already but haven't used it much, because I haven't had any uke bodies to sand. But now I have, and it works perfectly! What a joy to use. I gave it a couple of coats of shellac and attached the paper with double stick tape. The handle is of course not moving, that is the whole secret. 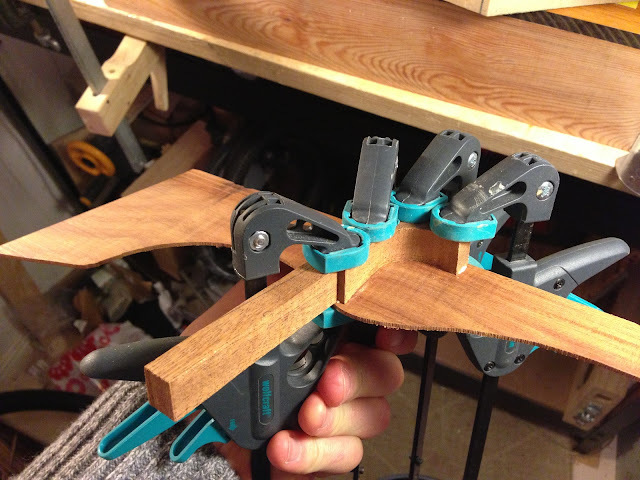 So it gives you a perfectly balanced sander that works on both concave and convex curves. 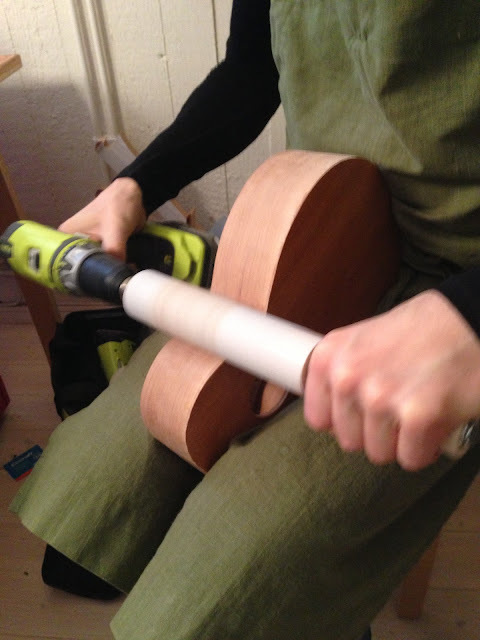 Glueing cracks is easier on a guitar than on a ukulele - the soundhole is so much larger. Putting cleats across the crack to secure it can be done with your hand, or as Dan Erlewine puts it in one of his books: "consider training a child to do this". 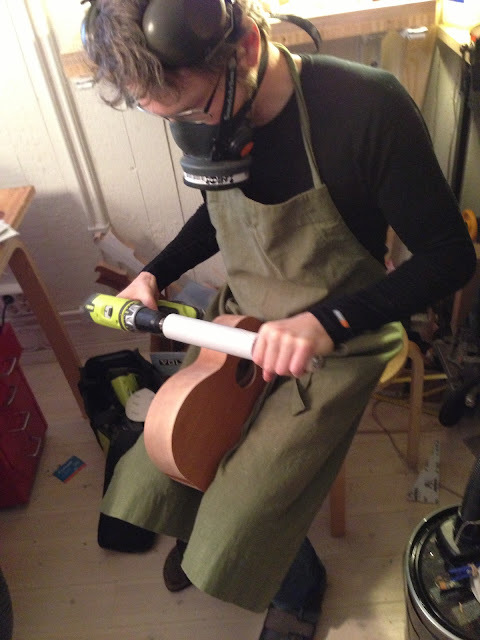 But for fixing a factory made baritone, I needed to figure something out. And while seated in an important meeting last week, I was suddenly overcome with inspiration. In the pics you can see the process step by step. 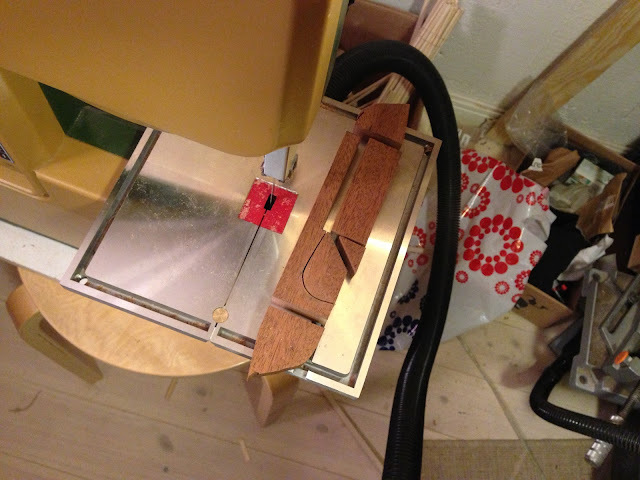 First, I put some scrap mahogany through the bandsaw. Then I glued side pieces to the two parts, it happened to be koa. A torn apart tape measure goes in the now hidden curved slot, and a weak magnet is attached to the end (there will be modifications to this). 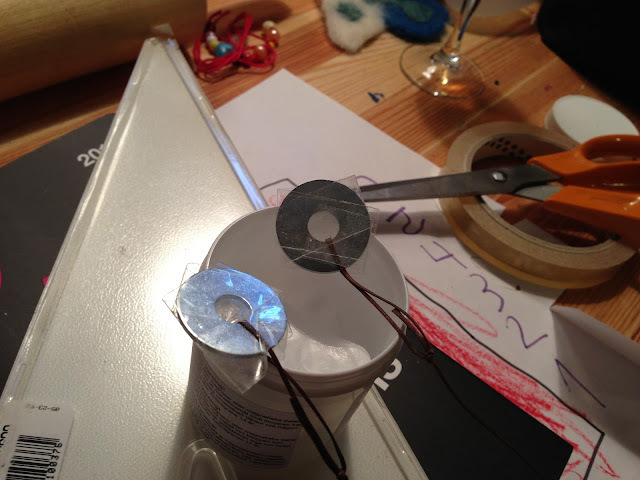 Washers with strings are wrapped in ordinary tape, with the sticky side out. A really really strong magnet is located across the crack, and a cleat is held to the washer by the tape. You see where this is headed don't you? 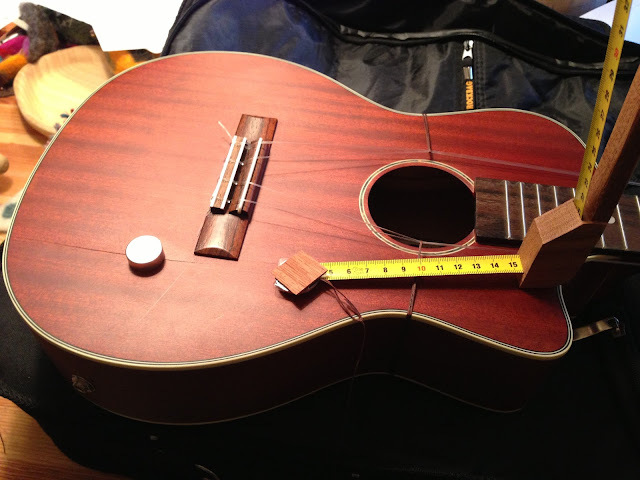 By feeding the tape measure to the proper location inside the uke, I can get the cleat exactly where I want it before it and the washer beneath it is sucked up by the magnet. 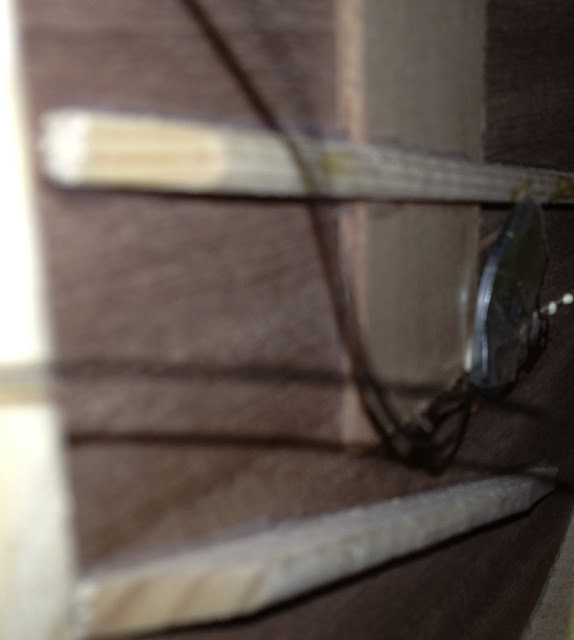 I put glue in the crack as well of course, and fixed a long clamp across the body. Two cleats, in place! But it got a bit awkward when I wanted to place the second one, the weaker magnet under the tape measure stuck to the strong one as well. 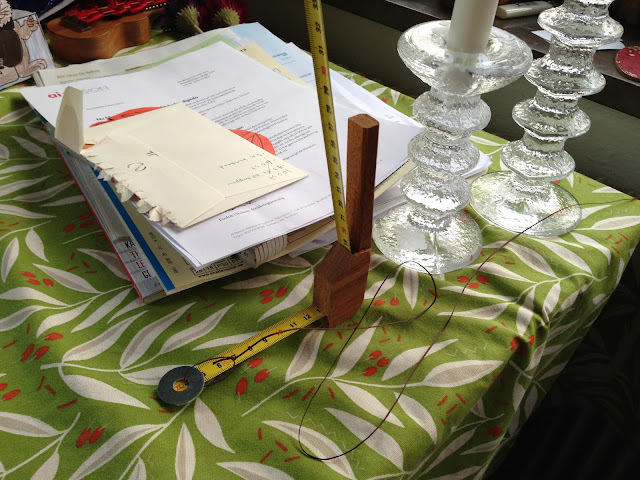 So next time I'll just rely on the tape, and may even fix a small length of plastic material to the measure. It sticks too. But I am very pleased! 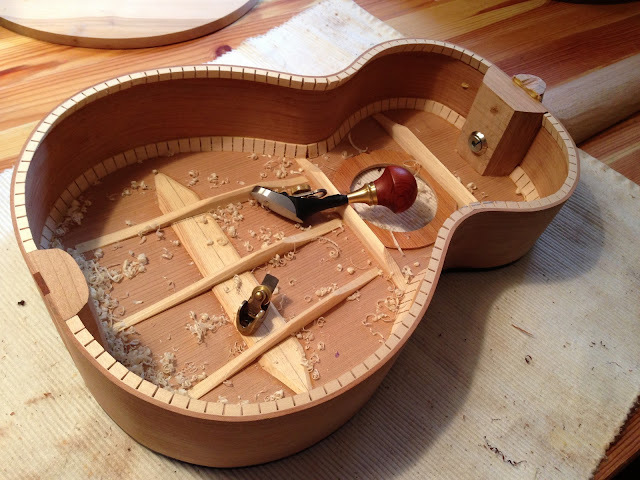 This is a soundboard for a mini guitar. A proper mini guitar this time, with six strings and all. I guess you could compare it to a 'guitalele' but I think those are bit too small and fugly. 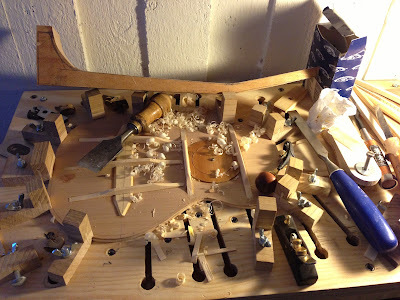 I haven't decided upon tuners yet, might be ears, might be a slotted headstock as on classical guitars.